이 책은 1316년(고려 충숙왕 3) 8월에 보현사 비구 석연이 주선하여 변산에서 개판된 불교 의식집이다. 『자비도량참법』은 양의 무제가 찬수한 뒤에 대양의 천감연간(502∼519)에 고승들이 번잡한 곳을 없애고 핵심이 되는 요지를 촬록하였으며 또 여러 경전에서 묘어를 선택하여 모았다. 세월이 지나는 사이에 본문에 착오와 와전이 생겨나자 원대에 이르러 내용을 대교(對校)하고 심정(審訂)하여 다시 정리하였으므로 상교정본이란 말을 붙이게 되어 그것이『상교정본자비도량참법』이다. 이『상교정본자비도량참법』은 일종의 참회문의 총서라고 할 만큼 여러 경전에 들어 있는 참회의 방법과 내용들을 일정한 체계로 엮어 낸 참법서이다. 본문에는 피휘 결획이 있어 고려본의 특징이 나타나 있고 권10말에는 간행사항과 간행에 참여한 사람들이 수록되어 있어 불교의식뿐만 아니라 불교사 및 서지학연구에 귀중한 자료이다. Reprinted in the eighth lunar month of 1316 (the third year of the reign of King Chungsuk during the Goryeo Dynasty), under the initiative of Buddhist Monk Seokyeon at Bohyeonsa Temple, this is a systematic and comprehensive compilation of ritual contents for repentance and compassion from various scriptures. 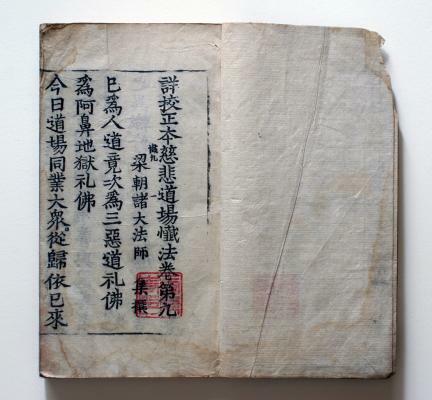 It was originally compiled by Emperor Wu of Liang and revised by senior monks during the Wudi’s Tianjian regnal period (502-519) by combining essential excerpts from the original edition with intriguing phrases from other scriptures. As mistakes and distortions appeared with the passage of time, this book was thoroughly cross-checked and proofread during the Yuan Dynasty, and was given the present title. With forbidden characters and missing strokes, the text reveals characteristic features of Goryeo publications. Volume 10 contains a publishing note and a list of people who participated in the project, providing valuable information about the history of Buddhism and bibliographic studies as well as Buddhist rituals.